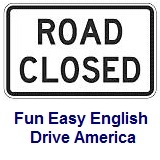 ﻿ Fun Easy English - Drive America - United States of America road signs, rules, and regulations regulatory, train. Regulatory road signs for railroads regulate traffic interaction with train and railroad tracks. Regulatory road signs for light rail transit regulate traffic interaction with train and railroad tracks. Driving on the tracks is not permitted. Do not pass the stopped train. The center lane is for train only. The right lane is for train only. The left lane is for train only. Indicates the railroad tracks run in the middle of a divided highway. Indicates the presence of a railroad crossing. Indicates 3 tracks are present. Traffic is not permitted to stop on the railroad tracks. The railroad tracks are out of service and not being used. Traffic is not permitted to turn right across the railroad tracks. Traffic is not permitted to turn left across the railroad tracks. Indicates traffic should look in both directions before crossing the railroad tracks. Indicates traffic should stop when the light is flashing. Supplemental plaque for exempt vehicles.